At first glance, Trump and Leach make an unlikely pair, but their relationship is rooted in the innate sense of curiosity that both men possess. Both march to the beat of their own drum, and both hold little regard for anyone’s opinion of them. 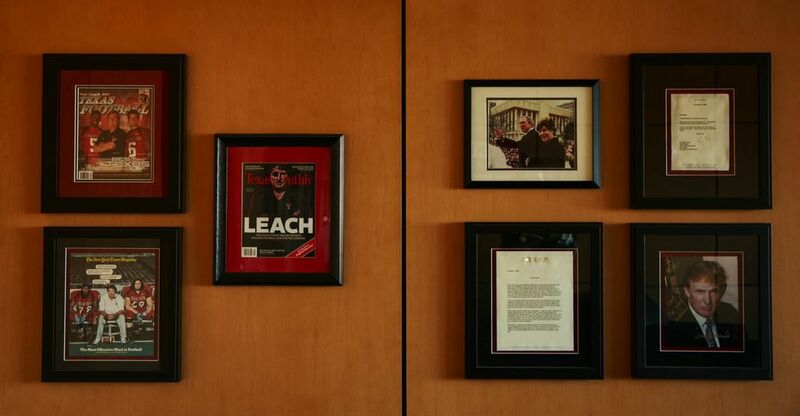 PULLMAN – On one wall in Mike Leach’s spacious Washington State football office, across from the life-sized talking pirate, next to a framed Texas Monthly magazine cover that depicts Leach as a pirate with an eye patch, and just under a framed letter from former President George W. Bush, sits an autographed glamor shot of the man who’s in the running to become the 45th president of the United States. 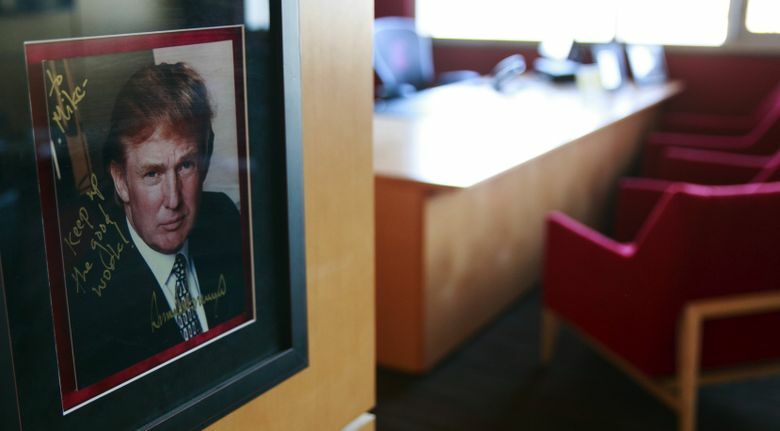 “To Mike, keep up the good work,” reads the inscription, scrawled in gold ink over a portrait of Donald Trump – the words situated nicely in the top left corner so as not to obscure Trump’s coiffed golden blond ‘do, or the trademark bold half-smirk that’s inundated media all over America this spring. At first glance, Trump and Leach make an unlikely pair. After all, not many real estate moguls care to spend their free time on the phone picking the brains of college football coaches. But for more than a decade, the two have shared a unique friendship that dates to the days when Leach was building his reputation as a first-time head coach at Texas Tech, and Trump made more headlines for his reality show “The Apprentice” than for his opinions on immigration and foreign policy. Their relationship is rooted in the innate sense of curiosity that both men possess – one that has bred diverse interests and the tendency both Leach and Trump have to march to the beat of their own drum and hold little regard for anyone’s opinion of them. Even though Leach has made his living as a football coach, he holds a law degree, has written a memoir and a book about leadership lessons to be taken from the life of Native American chief Geronimo, is fascinated by pirates and history, and has a voracious appetite for learning new things – learning to speak Spanish, by the way, is his newest endeavor this spring. Trump’s interests are just as varied. He made his millions in real estate, but has also written a series of books, owned the Miss Universe beauty pageant, produced his own reality show and founded a modeling company. Trump’s love for football is well known. The Republican candidate once owned the New Jersey Generals of the now-defunct United States Football League. Yet, it was Leach who first sought out the real estate tycoon in the summer of 2004, while on a trip to New York City with his three daughters. While on the plane from Lubbock, Texas to New York, Leach read Trump’s book “How to Get Rich” and was quite taken by Trump’s business acumen. “He described how he would buy these properties that were literally part of the New York skyline, first have a vision of what it was and what it could be, then make it that way. They literally did one building after the next,” Leach says. “At any rate, as you walk down the street in New York, you see all these buildings that he patched and got them on their feet. “You’re constantly searching for parallels. It’s wasn’t this changing moment, but as you look and read, you draw from a lot of sources,” Leach says. “So we’re walking by all these big buildings in New York that I’d read about in the book, and I’m thinking, what the heck, let’s call him,” Leach says. The coach dialed information to get a number for Trump Enterprises, then called the main line, where he talked a receptionist into transferring him to Trump’s personal assistant, Meredith McIver. Leach didn’t get to speak to Trump that day, but as he walked the streets of New York City with cabs honking in the background and his daughters exchanging amused looks as they trailed along behind him, he bonded with McIver in a phone conversation that centered on their Utah ties – he went to BYU and she’s a Utah alum. Months later, when Leach was in a quarterbacks meeting preparing the Red Raiders to play Kansas, the call came. Leach’s assistant fielded the call but was initially skeptical that the real Donald Trump was actually phoning to speak with Leach. She put him on hold and went to tell Leach that “a ‘Mr. Trump’” was on the phone. By the time Leach took the call, Trump had gone into a meeting of his own. But the following week, after Texas Tech rallied from a 25-point deficit to beat Kansas on the road, Trump called again. This time, Leach’s assistant raced into the room to tell him Mr. Trump was on the phone again. “Then I talked to him and we had a great conversation,” Leach said. Trump congratulated Leach on the win and the two men – each a CEO in a different sense – proceeded to shoot quick-fire questions at one another. The conversation diverged into a multitude of topics that didn’t necessarily link in any way. “He’s a real curious guy, very curious. … The funny thing is, as fascinating a guy as he is, it’s a little bit of a battle because you’re trying to interview him, but he’s interested in all your stuff,” Leach said. “You’d better get him interested in the first phrase or he’s out. The two have maintained their friendship since that first phone call. 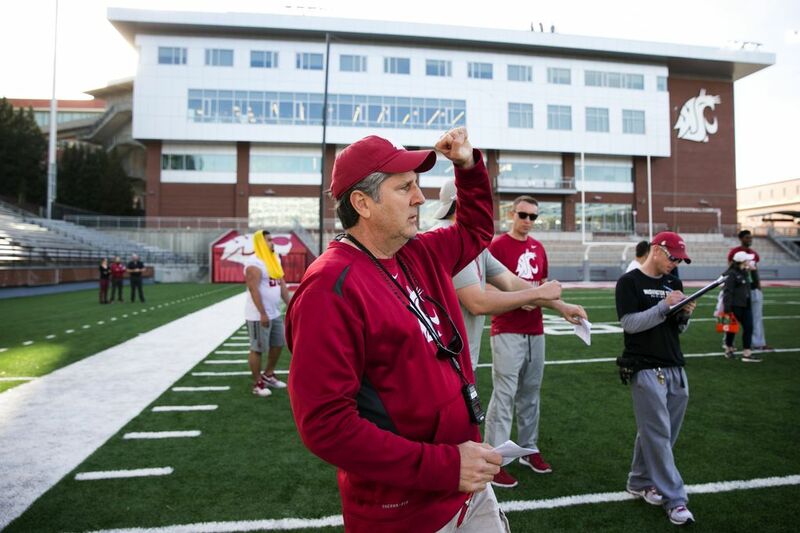 Trump’s representatives did not respond to several attempts from The Seattle Times this week requesting a comment about his friendship with WSU’s football coach, but Leach says they chat over the phone from time to time. Whenever Leach is in New York – usually in December for the annual National Football Foundation and College Football Hall of Fame dinner – he makes it a point to try and get together with Trump. The coach stops short of claiming that it’s a foregone conclusion that Trump will get his vote in the November presidential election should he emerge as the nominee, but said he respects Trump because the candidate is not connected to the current political establishment. “Trump is legitimate because he’s an independent thinker and problem solver. … Nobody is going to agree 100 percent with anybody, but in the end, on any issue, there’s a lot of moving parts and problems. So the question really is, ‘Who’s the best at solving problems?’” Leach said. “All those who’ve been in Washington for decades have proven they can’t solve problems. One of the reasons they’ve proven they can’t solve problems is that they can’t think independently. Oh and for the record, Leach says that Trump’s decision to run for president wasn’t made on a whim. “This wasn’t just a lark. He’s been talking about running for president ever since I’ve known him,” Leach says.